One of the finest and lasting achievements of the last Labour government was devolution. It is simply impossible to imagine a Scotland without a devolved parliament, able to devise Scottish solutions to Scottish issues. However, the party that brought us devolution has never fully devolved its own structures. Previous reviews have identified some of the issues, but even these reforms have not been fully implemented. The resignation of Johann Lamont MSP with her ‘branch office’ comment highlighted the problem again. Since then, groups within the Scottish Labour Party have called for greater autonomy, up to and including the creation of an independent Scottish Labour Party. This is not simply a matter of party organisation. It is damaging in the current political environment in Scotland if the Scottish Labour Party is not seen to be managing its own affairs. We cannot claim to be the party of devolution if our own party organisation does not reflect our policy approach. Kez Dugdale has shown real leadership in tackling this issue, supported by Jeremy Corbyn, a leader who instinctively gets the need to move away from the centralised state. Kez's federal proposals mark a radical new approach to the issue. Her plan is for decisions about UK General Election selections, the management of local Constituency Labour Parties, party membership and many other things to be taken by Scottish Labour. Under a federal solution you build the party from the grass roots upwards, rather than hand down responsibilities from above. A federal solution to Labour Party structures doesn’t split Scotland apart from the rest of the party. Like other federal structures across the world it strengthens the whole. Sadly, there are some in the UK party who clearly don't get it. Inexcusably, they think it's clever politics to leak the preliminary discussions to the Murdoch press. As Kez elegantly put it: "All across the world, people want decisions taken at a local level. The days of centralised, one-size-fits-all organisations are gone. They aren’t coming back. We can either put our heads in the sand or adapt to face this new reality." The challenge with any federal approach is that the UK is an asymmetric state. It is for other parts of the UK to decide the degree of devolution they want for their own nations and regions. Initially, this would be federalism for devolved administrations, with the option for others to follow at a pace of their own choosing. The detail must of course be subject to consultation, but the direction of travel is clear. This is not an issue that can again be kicked into the long grass. Change can be challenging, but Labour showed the way with devolution for nations within the UK and can do so again with new ways to engage communities across the UK. In doing so, Labour has to do the same with its own structures. Federalism is an approach whose time has come. Blog Action Day - defending human rights. As a trade unionist in a country like Scotland I take communicating with others and expressing myself freely for granted. It is central to living in an open and fair society. However, across the globe fellow trade unionists do not have the same freedoms and it is those comrades that we should salute on Blog Action Day. Governments pay lip service to ‘free speech’ in almost every constitution in the world, some even sign up to international conventions like the ILO. However, the reality isn't so free. Across the world trade unionists are thrown into prison, or worse, for speaking out. As Amnesty International puts it; "Our right to seek, receive and share information and ideas, without fear or unlawful interference, is crucial for our education, to develop as individuals, help our communities, access justice, and enjoy all our other rights." Trade unions in Colombia were until around 1990 among the strongest in Latin America. However the 1980s expansion of paramilitarism in Colombia saw trade union leaders and members increasingly targeted for assassination, and as a result Colombia has been the most dangerous country in the world for trade unionists for several decades. Between 1986 and 2010 over 4000 were killed according to one source. Most assassinations were carried out by paramilitaries or the Colombian military; some were carried out by the guerrillas. By 2009 only around 4% of workers in Colombia were unionised. Amnesty has recently reported that four other trade unionists and retired military officers close to opposition groups were arrested in Conakry, Guinea, between 4-6 October, days before the contested 11 October presidential elections. They have been charged with contempt of the head of state and defamation - something I do almost daily on Twitter and Facebook, as well as in this blog! Ismail Abdi, Secretary General of Iran’s Teachers’ Trade Association (ITTA), has been detained in Tehran's Evin Prison since 27 June this year for "organising and participating in illegal gatherings” for his legitimate trade unionist activities. Again, organising meetings like this is something I would take for granted. In September 2015 trade unionist and prisoner of conscience Shahrokh Zaman, died in Iranian custody. On April 21 2014 the Turkish police burst into a peaceful gathering of trade union representatives who were organising their activities for May 1 in a hotel near Taksim Square, Istanbul. The police intervened with tear gas & shields, injuring people and 12 DISK union members were detained. The ETUC condemned the ongoing violations of trade union and human rights in Turkey and called on the Government to abide by International Labour Organisation conventions which they have signed. "Sometimes international solidarity is more than passing motions at conferences and signing petitions on social media. The Turkish trade unions are in a struggle with an anti-trade union government that uses war against its own citizens for electoral advantage." Finally, the U.K. government's Trade Union Bill illustrates why we should not be complacent nearer to home. Plans include the criminalising of some picketing activity, and even controls over blogs, Twitter and Facebook activity during disputes. A Tory MP has described these plans as reminiscent of Franco's Spain. In addition, Government plans to repeal the Human Rights Act are not only a threat to our liberties in the UK, but they also send a shocking message to illiberal regimes across the world. On the 50th anniversary of the opening of Cruachan Power Station, we should remember not just the amazing engineering achievement, but also the 36 men who died building it and many others who perished as a consequence of working there. Cruachan Power Station, in which the power to top up the National Grid is stored, is celebrating its 50th birthday today. 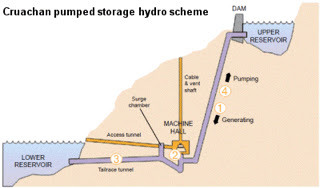 It's pumped storage system ensures there is also enough power at times of peak demand on the grid. A dam was built in a corrie on the summit of Ben Cruachan as a reservoir for turbines in a massive cavern excavated inside the mountain. At times of low demand the turbines act as pumps drawing water back from Loch Awe up to the reservoir. If you drive down the main road to Oban you can easily miss this major power station, marked only by the visitor centre. This is ironic given the campaign against the scheme mounted by the Scottish Landowners Federation at the time. It also provides a fabulous, if challenging, walk over what is known as the Ben Cruachan Horseshoe - 8 hours to cover 8 miles with seven summits! It was many years ago that I walked it, but my muscles still twitch at the memory! There is a much shorter, but still pretty steep climb to the reservoir, on a path about 100 yards east of the visitor centre (OS Pathfinder Guide 31 - Walk 27). A 4,000 strong workforce was drafted into Argyll to hand drill their way into the bowels of Ben Cruachan to construct the cavern - nicknamed the Tunnel Tigers. "Thirty six men died in the construction phase but many, many, many more died with illness afterwards, including my brother, who died from emphysema. There was no health and safety then, that is the reason I am wearing a hearing aid now, and we never had anything, no goggles, no oil skins, just a helmet. The noise was unbelievable, for the first fortnight I was stone deaf, I couldn't talk, it was just sign language. We used sign language to tell people to get out of the way. You got stones overhanging and some of them could weigh over a tonne, everybody looked out for me, everybody saved my life, everybody saved everybody's lives. Nobody was ever born in a tunnel, you had to learn. It was absolutely amazing that more workers weren't killed, because we were working with electrical detonators and we were drilling with water because we couldn't dry drill. I would imagine over 100 have died later from emphysema. We were all mad, you had to be. I would never go down today." There are a few lessons for today. Firstly, this is the health and safety 'monster' culture David Cameron would take us back to by deregulating safety and slashing staff in the HSE - not to mention undermining safety representatives in the Trade Union Bill. Secondly, the importance of planning and public ownership in the energy sector. The scale of hydro developments in the Highlands would not have been achieved in the so called energy market. It took a visionary Labour politician, Tom Johnston, to drive the plan forward. Despite the nimby's of his day! Thirdly, in the context of immigration scare stories it is less well known that much of the labour force for the early hydro schemes were displaced persons. It is Germans, Poles, Latvians and many others that we have to thank for electricity in the Highlands. So, let's celebrate a major engineering achievement, but also commemorate those who died in order that we can switch the kettle on at half-time. There are a couple of books worth reading if you want to know more. My favourite is Emma Wood's, 'Hydro Boys', and also 'The Dam Builders' by James Miller which is well illustrated. 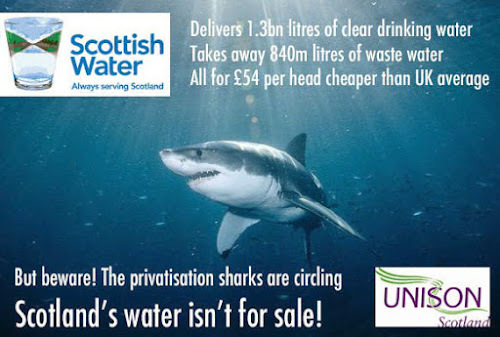 Scotland's public sector water contract privatised. Confused? You should be! A £350m contract to provide water and wastewater to Scotland’s public sector has been awarded to a privatised utility firm in East Anglia. Confused? Scotland has a public water corporation, Scottish Water that is accountable to Scottish Ministers and the Scottish Parliament. Scottish Water is responsible for the provision of water and waste water services to almost all domestic and non-domestic properties and for maintaining the public system. However, there is competition in the provision of customer-facing activities such as billing, charge collection, meter-reading and complaints handling for non-domestic customers in Scotland. This means that Scottish Water levies a wholesale charge on licensed retailers for non-domestic customers. Licensed retailers can agree their own charges with customers, subject to them being no higher than a default tariff set by the Water Industry Commission Scotland (WICS). Scottish Water is also a retailer; through its own retail arm Business Stream, which provides a service to the vast majority of non-domestic customers in Scotland. The market was created by the Water Services etc. (Scotland) Act 2005. The then Labour led administration was persuaded that this was the least they could get away with due to the provisions of the UK Competition Act 1998. The 2005 Act prohibited common carriage and household competition and put a licensing regime in place for non-domestic competition. UNISON Scotland opposed the legislation and would argue that it has simply created an unnecessary bureaucracy. The claimed savings are almost entirely down to water efficiency measures that do not require competition to implement. As the public bodies are non-domestic customers they come under this system of retail competition and the Scottish Government, actually the then Infrastructure Secretary Nicola Sturgeon, put one big contract for public bodies out to tender last August. It could be argued that this was not the best way to organise this tender. It appears that Anglian Water has submitted the lowest price bid in an evaluation that was 50/50 price and quality. The Scottish Government is not obliged to accept the lowest bid, but it would have to have a good reason for not doing so under the utilities procurement regulations. In fairness, the Scottish Government had few options because the system of retail water competition is the ultimate in market madness. £350m will be paid to Anglian Water in Huntingdon, only for most of that money to be repaid to Scottish Water in wholesale charges. The cost of this crazy system is picked up by the taxpayer. However, it was unwise to include savings from water efficiency measures that should be undertaken anyway to spin out the alleged benefits of the contract. It would also be interesting to know if the evaluation panel took into consideration the risk that this bid was a loss leader to give Anglian Water a base in Scotland. This is important because contractors who do this squeeze a margin post-contract from quality. The direct job implications are not likely to be huge, but significant for those impacted. Competition only covers the customer facing services i.e. call centre, customer service and transactional staff within Business Stream. This procurement also highlights the importance of addressing tax dodging in procurement, an issue UNISON and other civil society organisations campaigned for during the passage of the Procurement Act. There should be pre-qualification disclosure of company taxation policies and public bodies should be able to evaluate a tender on the basis of which company pays tax or not. Assessment of bids could make use of the Fair Tax Mark. The significance with this contract is that Anglian is one of a number of private water companies who are happy to take taxpayer funded public contracts, but less happy to pay corporation tax. A consortium called Osprey, made up of asset and pension managers in Canada and Australia, owns Anglian Water. Corporate Watch reported that Anglian paid £151 million to its private owners, but just £1 million in tax in 2012, after an operating profit of £363 million. It avoids millions in tax by routing profits through tax havens by way of taking on high-interest loans from their owners through the Channel Islands stock exchange. Anglian Water was described as a “significant repeat offender” in an Environment Agency report on polluters and was fined for polluting five years in a row. Friends of the Earth said of the company: “Clearly, this company is a classic example of a company which sees pollution fines as a legitimate business expense and doesn't care about the environment”. It would be interesting to know just how much weight the evaluation panel gave to this in their quality weighting. Non-domestic competition is not the only area of privatisation within Scottish Water. Last year the insider web site Utilities Scotland submitted FoI requests to ascertain the extent of privatisation in the delivery of the water and waste water capital programme. In the last four years, 92.5% of Scottish Water’s capital programme has been delivered by private contractors, 7.5% by Scottish Water staff. By any standard that is substantial privatisation. This is on top of PFI schemes run by a variety of privatised water companies. We are also concerned about the impact the Transatlantic Trade and Investment Partnership (TTIP) could have for Scotland’s public service model. The greater the privatisation, the easier it will be for overseas corporate interests to challenge our public water system. Scottish Water works well, is good value for money and water customers support the corporation staying in the public sector. While there were limited options for the Scottish Government on this occasion, we should be aware of the pressures for privatisation and the lessons to be learned for future procurement. If we are to create better jobs in Scotland we need to recognise and take action on job security, worker control, appropriate demand, fair pay and opportunities for training and development. I was giving evidence yesterday to the Scottish Parliament's Energy and Economy Committee's inquiry into work, wages and wellbeing. The evidence to the committee is well summarised in the Spice briefing. While the impact of low wages and poor quality jobs on individuals and the economy are becoming better understood, it also has an impact on health. Professor Bambra's evidence to the committee argues that low quality work combines low levels of control with high psychological demand which can lead to increased levels of chronic stress, muscoskeletal conditions, heart disease, hypertension, obesity and mental illness. There is also a strong economic case for better jobs. Well made by Professor Chris Warhurst at today's committee. The outcome of the current race to the bottom is the precariat. In some countries this can constitute as much of 25% of the workforce, whose contracts are either temporary or informal, or who arrive via employment agencies. In Scotland the numbers on zero hours contracts, particularly in the care sector, are understated because they largely ignore workers on nominal hour contracts. In its evidence to the Low Pay Commission, UNISON has highlighted that the conditions of the economy meet all the key criteria set out by the Low Pay Commission in its 2014 report as necessary for significantly faster increases in the minimum wage. These include; rising real wages in the economy generally, stable employment and an expectation of sustained economic growth. Other factors supporting an increase in wages are the upward trend in the scale of low pay in the economy. This will be exacerbated by Government cuts to tax credits and other benefits, particularly for workers with families. The value of the National Minimum Wage has been eroded in comparison to the Living Wage and young workers have been penalised through the lower rates and their exclusion from the new so called National 'Living Wage'. At the other end of the scale there is the growth in the income of high earnings groups that has entrenched the UK’s position as one of the most unequal countries among comparable nations that are members of both the EU and OECD. The committee asked us for specific evidence on the care sector that constitutes nearly 8% of the Scottish workforce and is a sector largely funded by the Scottish Government. The size of the Scottish care workforce has increased to 199,670, an increase of 5.3%. 77% of these work in home care and 85% are women. There are some very poor employers in this sector and they have been encouraged by poor procurement practice. The Procurement Act and new statutory guidance should enable us to tackle this by evaluating future bids on their workforce policies including the payment of the living wage. However, the better employers rightly say that this must be funded properly. Given the leverage of government money there is an opportunity to develop the sort of sectoral bargaining that has been so successful in raising standards and productivity in other parts of Europe. The care sector is a good example of where the race to the bottom in job quality and wages takes us. Staff who are desperate to exit the sector, creating high turnover, losing the continuity of care that is so important. This inquiry is a welcome look at an important and complex issue and I look forward to their conclusions. However, there are practical actions the Scottish Government could take to develop the ideas in the Working Together report and Fair Work Convention. The care sector would be a good place to start.